Paco Rabanne Spring Summer 2018. 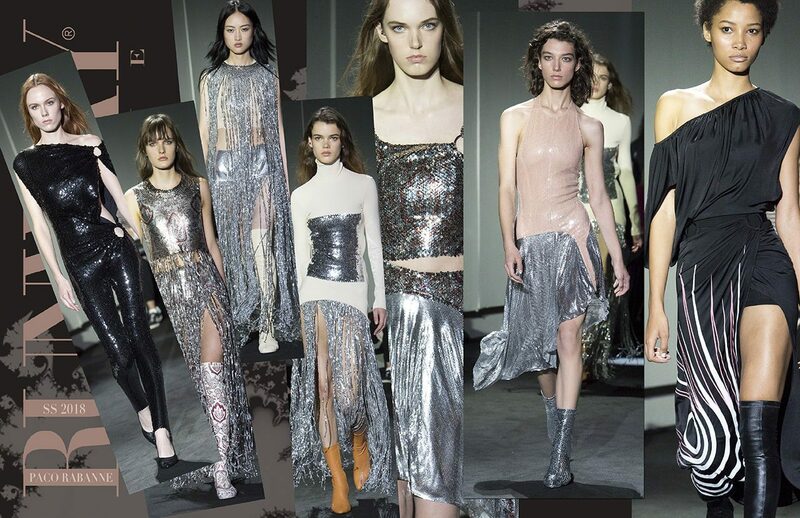 Disco inspired new Spring Summer 2018 collection of Paco Rabanne with all it sparkles and glitters remains urban. Working through a Seventies lens, Julien Dossena, artistic director of house, focused on fluidity — everything was made in jersey and stretch fabrics to hug the body and skim the skin. That era — its swinging skirts and louche ease — still resonates with current wardrobes and Dossena doesn’t do retro. The result was a chic, modernist take on for boogie nights’ slink — and a few options for days. 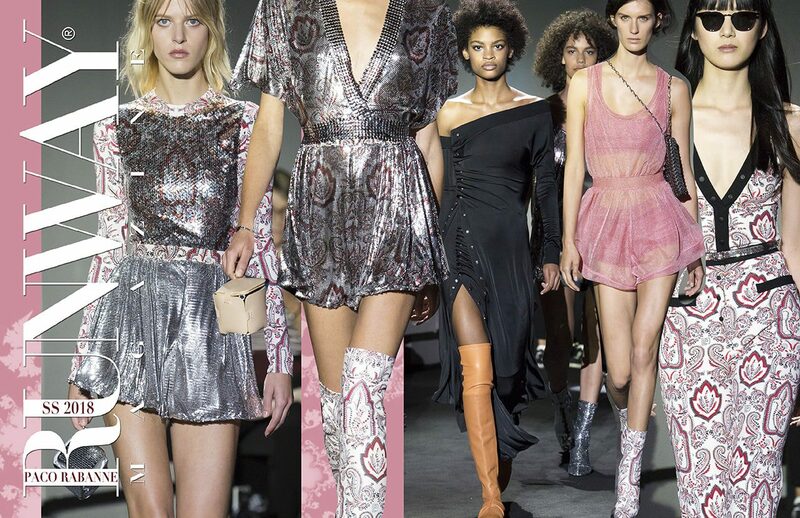 There was a tight sequined paisley shirt and kicky shorts, sheer gauzy rompers that shimmered and a one-shouldered red ruched dress unsnapped all the way up the leg. 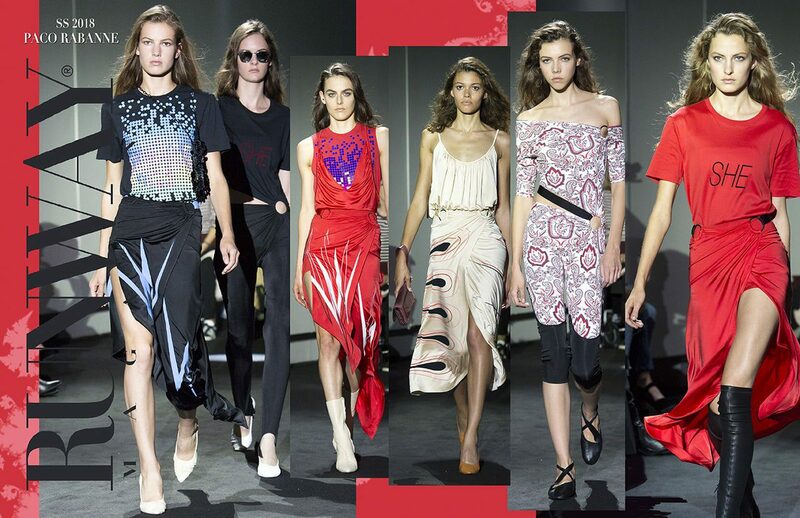 T-shirts stamped with the word “she” tucked into graphic-printed midi skirts that were cut to move added a pop moment, while silver sequined mesh sliced all kinds of ways — on trousers and a fringed maxidress over a fringed maxiskirt and aerodynamic Modish over-the-knee boots — could outshine a disco ball. Asked what kind of club he imagines girls wearing these clothes go to, Dossena said, “For me, all the pictures were The Factory. Andy Warhol wearing his sunglasses at night.” Alas, that time is long gone. But we do find ourselves in a Warhol moment, where everyone’s 15 minutes is spent in front of a camera rather than in a club. In that case, the sequins were perfect.